The Election Commission (Thai: คณะกรรมการการเลือกตั้ง; rtgs: Khana Kammakan Kan Lueak Tang) is an independent government agency and the sole election management body of Thailand tasked with overseeing all kinds of government elections (parliamentary elections and local elections) as well as referendums throughout the Kingdom of Thailand. Established by the Constitution, the Election Commission (EC) has extensive powers to manage, oversee, and regulate the electoral process. The EC has reacted to irregularities in the 2000 Senate elections, the 2006 House elections, and the 2007 House elections, forcing re-elections and disqualifying many candidates. The primary role of the Commission is to ensure that elections carried out in the Kingdom of Thailand are lawful and compatible with the Constitution. It is also in charge of enforcing National election laws covering: House of Representatives, Senate, Districts, Referendums, Bangkok Gubernatorial elections and Political parties. Its constitutional duty includes the publishing and all election returns, therefore formalizing them. The Commissioners also have the right to disqualify a candidate, or call for a re-count for a particular seat. Its responsibilities include the organization, management and counting of all elections and voting in the Kingdom, all procedures and staff will also be under the Commission's administration. Other roles are to advise and suggest to the National Assembly future policies concerning elections and suffrage. The Commission also have legal power as a law enforcement agency to investigate and indict those who break election laws through: bribery, corruption, vote buying and blackmail. The Commission also has powers to investigate the finances and donor lists of all political parties. Other responsibilities include: to educate the public about elections and the importance of them. The Election Commission of Thailand is made up of a committee of five members; one Chaiman (Thai: ประธานกรรมการการเลือกตั้ง) and four other Election Commissioners (Thai: กรรมการการเลือกตั้ง). The administrative side of the commission is run by the Secretary-General (Thai: เลขาธิการคณะกรรมการการเลือกตั้ง). As well as being a regular member of the commission, the five members are also given various responsibilities. 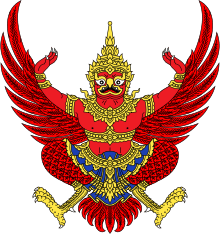 All Commissioners are appointed by the King, with the advice of the Senate of Thailand; for a term of seven years. The current Commission is the 4th team of Election commission, appointed on 13 December 2013. Prior to 1992, the responsibility of overseeing elections fell on the Ministry of Interior or Mahatthai Ministry. Under the premiership of Anand Panyarachun after the Thai general election of 1992, the Prime Minister realised the need to create a central and independent body, whose sole purpose was to regulate and manage elections. As a result, on 22 March 1992 the "Committee to Administer and Investigate Elections to the House of Representatives" (Thai: "คณะกรรมการติดตามและสอดส่องดูแลการเลือกตั้งสมาชิกสภาผู้แทนราษฎร") was created, a precursor of the Commission. The Commission in its current form was created in the 1997 Constitution of Thailand. 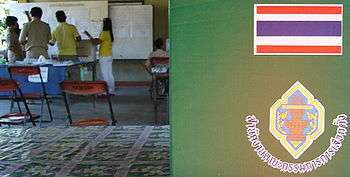 The Thai general election of 2006, which was held on 9 April for the House of Representatives and 19 April for the Senate. The main opposition parties, composed of the Democrat Party, the Chart Thai Party and the Mahachon Party, decided to boycott the election. They felt that Thaksin Shinawatra's government had unfairly called an election to divert public attention form the Shin Corp scandal. Despite this, the election went ahead. On 3 April 2006, the People's Alliance for Democracy (PAD) petitioned the Administrative Court to suspend the results of the election and accused the Election Commission of violating voter privacy. It accused the Commission of placing voting booths so that voters' backs were to the public, when in all previous elections, voters faced the public, with a board one-half meter tall at the front of the booth separating the voter from the public. The Commission claimed the new arrangement was designed to prevent various forms of poll fraud including the use of cameras by voters to take photographs of their ballots. After the 2005 election, cameras and cameraphones were banned from voting stations due to fears that canvassers would demand ballot photographs in return for money. However, the PAD claimed that this allowed onlookers to peek over voters' shoulders and see who they voted for. The elections were eventually declared invalid by Thailand's Constitutional Court, which found the positioning of the voting booths violated voter's privacy. The Constitutional Court pressured the Election Commission to resign over its management of the April elections. The Court failed to persuade the then President to resign; however, it did prevent the Senate appointing a replacement for commissioner Jaral Buranapansri, who had died. This prevented the Commission from achieving a quorum. It later found the remaining Commissioners guilty of malfeasance and jailed them for only one night. An entirely new commission was appointed. Polling Station during the 2007 election, a voting booth in the foreground, election workers (including a guard) in the background. A number of MPs (mainly those elected for the PPP) were given so-called "red cards" for alleged vote-buying, meaning they would not be able to contest the resulting by-elections. Other MPs were issued "yellow cards" and not banned from contesting the by-elections. By 3 January 2008, the Election Commission had endorsed 397 MPs and was still investigating 83 MPs for fraud. By-elections were held on 13 January, 17 January, 20 January (the day before the first session of the newly elected parliament) and 27 January 2008. The Electoral Commission was still looking into allegations of fraud by PPP deputy leader Yongyuth Tiyaphairat. If was given a red card, the PPP faced dissolution. PPP officials have stated that they are not worried over the possible dissolution, and that they would simply find a new party instead; local reports state that a likely candidate for takeover by PPP members would be the Thai Land Power Party (Palang Pandin Thai Party). On 19 July, both Yingluck Shinawatra and Abhisit Vejjajiva were acknowledged as the members of the House. On 27 July, the acknowledgement extended to further ninety four elected candidates. Now and eventually, the number acknowledged sufficed to constitute the House. This, however, did not include Jatuporn Prompan whom the Election Commission declared to have lost the suffrage due to failure to vote in both the previous and the present elections. The Constitution requires that a member of the House must possess the suffrage, and also prescribes that a person failing to vote in an election loses the suffrage but regains it once voting in the next election. ↑ "Administrative Court urged to suspend poll results". The Nation. 7 February 2005. ↑ "3 elected candidates of winning party 'yellow-carded'". People's Daily Online. 26 December 2007. ↑ "Thai election agency endorses 397 candidates winning general election". People's Daily Online. 3 January 2008. ↑ "Thai election agency completes filling House seats". People's Daily Online. 29 January 2008. ↑ "Thailand starts by-elections in Northeast". Xinhua. 13 January 2008. ↑ "Nakhon Ratchasima Constituency 3 set to hold by-election 13 Jan". MCOT English News. 5 January 2008. ↑ "Poll agency issues yellow card to fourth PPP elected candidate". 5 January 2008. 1 2 "Thai election agency issues more yellow cards to winning candidates". People's Daily Online. 7 January 2008. ↑ "Thai election agency disqualifies poll winner candidate". People's Daily Online. 10 January 2008. 1 2 "Thai election agency disqualifies more winning candidates". People's Daily Online. 7 January 2008. ↑ "Thailand starts third round by-elections". People's Daily Online. 20 January 2008. ↑ "Jatuporn excluded due to failure to vote; further 94 candidates becoming new MPs". Thairath. 28 July 2011. Retrieved 28 July 2011.